St Mirren have signed Ross Stewart twice within a week. 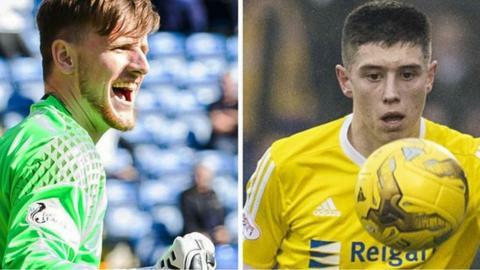 Only they are two different people - forward Ross Stewart joining goalkeeper Ross Stewart in making a switch from League One outfit Albion Rovers. They are also both 22 and have been with the Coatbridge club since leaving Motherwell in 2015. Central defender Gregor Buchanan, 27, has also signed from Dumbarton, while midfielder Jordan Kirkpatrick, 25, has joined from Alloa Athletic. All four make the step up to full-time football. Buchanan, who joined Dumbarton from Dunfermline Athletic in 2015, has signed a one-year contract, while the other three have secured two-year deals. Assistant manager James Fowler told his club website: "Buchanan has played in the Championship over the last couple of years and kept Dumbarton in there. "It was an area we were looking to strengthen and we are maybe looking to get another few in as well. "Ross is a wee bit younger and maybe a work in progress, but he has a lot of good attributes, can score goals and can play in different positions." Stewart has scored 12 goals in 34 appearances this season. His namesake, who played for Scotland Under-19s, made 41 appearances in goal for Rovers as they finished eighth in League One. Kirkpatrick played under St Mirren manager Jack Ross last season at Recreation Park and scored 17 goals as Alloa finished runners-up in League One but missed out on promotion via the play-offs.